The self-proclaimed Lugansk People’s Republic (LPR) has announced it has withdrawn all of its heavy weapons from the demarcation line in compliance with the Minsk-2 peace agreements and has informed the OSCE of the hardware’s new location. The withdrawal has been confirmed by LPR Prime Minister Gennady Tsypkalov. 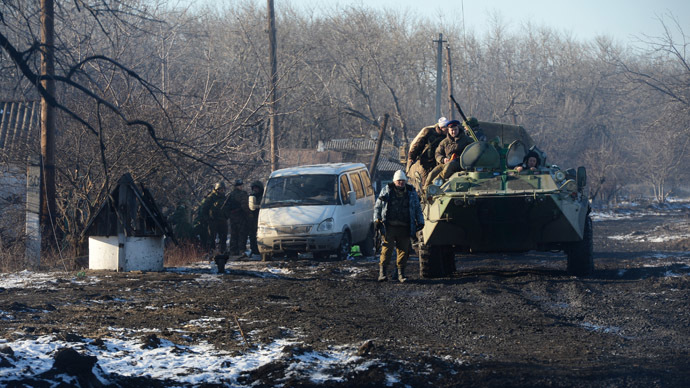 The Donetsk People’s Republic announced withdrawal of 21 artillery groups on Saturday. “The DPR has completed the withdrawal of heavy artillery, today we have withdrawn 6 Gvozdika (Carnation) artillery systems in the southern direction. The withdrawal was taking place under control of OSCE,” DPR spokesman Eduard Basurin said on Sunday, according to Tass. Ukrainian troops in their turn said they were completing the first stage of the artillery withdrawal, but will pull back heavier weapons later. “Yes, we are completing the withdrawal of 100-mm anti-tank gun Rapira,” the spokesman for Kiev’s military operation in Donbass, Anatoly Stelmakh, told RIA Novosti. “As soon as we see shelling of our positions ceased, we’ll continue withdrawal of weapons of other calibre,” he added. Both sides of the conflict have repeatedly accused each other of ceasefire violations. The DPR recorded 26 incidents with shooting by Kiev’s troops over the last 24 hours. Kiev’s soldiers say their positions were fired at five times Saturday. However, they added that the rebels weren’t shooting during the night, which they said was calm.